Today it's exactly one year ago the Snowden-leaks started. Among the many highly classified documents which were disclosed during the past year are various charts that provide us with actual numbers about the amount of data the National Security Agency (NSA) is collecting. Here we will take a look at those numbers and see what we can learn from them by comparing various sources and from breaking them down into NSA-divisions, countries and collection programs. As still only fragmented parts have been published, this overview cannot provide completeness or full accuracy (estimates are shown as round numbers). The most detailed numbers about NSA's data collection are from the BOUNDLESSINFORMANT tool, which is used by NSA officials to view the metadata volumes collected from specific countries or by specific programs. This total of 221 billion telephony and internet records a month equals 2,6 trillion a year and 7,3 billion a day. However, the actual number of what NSA collects worldwide might be higher - see the update below. The BOUNDLESSINFORMANT tool seems to be very accurate, but there's another chart that gives different numbers. 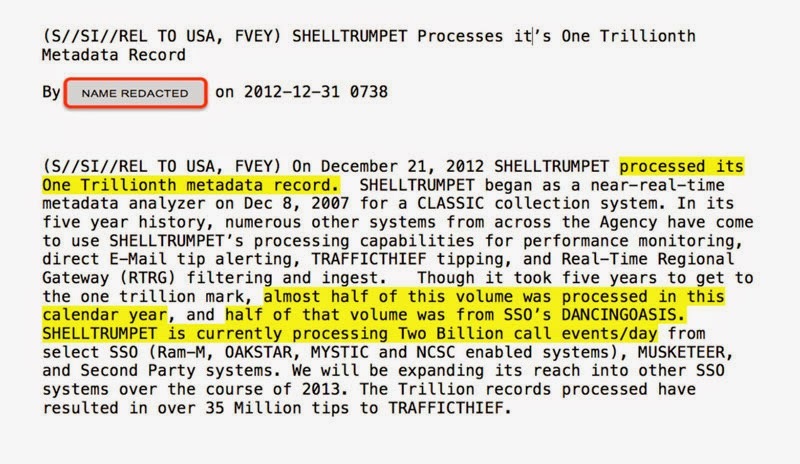 It's from a 2012 presentation for the SIGINT Development conference of the Five Eyes community and shows the volumes and limits of NSA metadata collection. The chart was published by The Washington Post on December 4, 2013 and again in Greenwald's book 'No Place To Hide' on May 13, 2014. - internet metadata that had to be deleted because there was apparently not enough storage space. 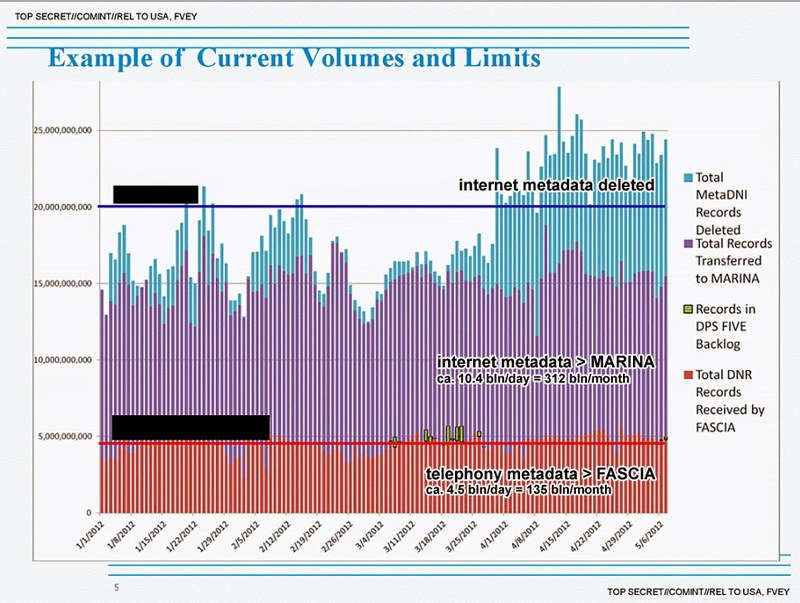 There's a difference of 11 billion telephony metadata between both charts, but an even bigger gap exists between the internet metadata: the Volumes and Limits chart shows 215 billion more than BOUNDLESSINFORMANT. This discrepancy wasn't noticed in the press reportings, nor in Greenwald's book, so at the moment there's no clear explanation for this. A possible explanation for the discrepancies between these numbers can be found in a FAQ document for the BOUNDLESSINFORMANT tool, which says the numbers shown in the "map view" are lower than in the so-called "org view" of the tool because for the latter, also records are counted that doesn't contain the country identifiers which are needed to be counted in the "map view". This would also explain the far bigger difference between the numbers of internet metadata, because for internet communications it is often much more difficult to attribute them to a particular country than for telephone conversations (which always contain country and region codes). This means the Volumes and Limits slide provides the more realistic numbers. After being processed by FASCIA, the telephony metadata go to MAINWAY, which is another huge NSA database that keeps these kind of data for at least five years. In 2006 it was estimated that MAINWAY contained 1,9 trillion (1.900.000.000.000) call detail records. For comparison: in 2007, AT&T's Daytona system, which is used to manage its call detail records (CDR's) supported 2,8 trillion records. In 2012, T-Mobile USA Inc. upgraded to an IBM Netezza 1000 platform with a capacity of 2 petabytes. This is used for loading 17 billion records a day, making 510 billion a month and more than 6 trillion a year. If we assume the telecom providers and NSA use "records" in the same sense, than this shows that the telecommunication companies produce far more phone call metadata than NSA collects. As T-Mobile USA alone apparently creates 4 times more records as presented in NSA's BOUNDLESSINFORMANT tool, the domestic telephone metadata collection under section 215 Patriot Act cannot be included in the numbers we've seen so far. Also interesting is that according to slides about the Hemisphere project, some 4 billion telephone metadata records are collected every day from any carrier that uses AT&T switches in response to grand jury subpoenas in counter-narcotics investigations. During a parliamentary hearing in Germany, an official of BND explained that one cell phone creates between 100 and 200 metadata and business records a day. For 4.5 billion cell phone users worldwide that would equal at least 450 billion metadata each day. A 2017 tourism report from the Netherlands provided numbers showing that in January 2013, Dutch mobile phone users generated 255 million metadata a day or 7,65 billion a month. The report also confirms that for Dutch users, mobile phones create about 100 "transactions" a day. Even more metadata seem to be collected by NSA's British partner agency GCHQ, which according to this slide from 2011 collects 50 billion metadata per day. This makes 1,5 trillion a month and an astonishing 18 trillion (18.000.000.000.000) a year! This (partial) slide was published in Greenwald's book No Place To Hide, but without any further explanation, so we don't know whether GCHQ is able to actually store everything or has to delete large amounts, like NSA. From the slide itself it seems that the number of 50 billion refers to internet metadata alone, which would make this number even more remarkable. For indexing and searching the content of internet communications, GCHQ uses the TEMPORA system, which is capable of processing the traffic from 46 fiber-optic cables of 10 gigabits per second. This makes that 21 petabytes of data flow past these systems every day. These numbers indicate from which countries NSA gathers most data, but the exact meaning of the numbers has still not been clarified. We do know that BOUNDLESSINFORMANT counts metadata records, but what these records exactly are (for example: how many records are created by one phone call? ), and how they are attributed to a specific country is not clear. Communications by definition have two ends: the originating and the receiving end. When both ends are in the same country, it's easy to attribute it to that particular country. But when the originating and the receiving ends are in a different country, how is such a communication registered? Maybe for both countries, although that would make many of them appear in these numbers twice. Edward Snowden saw the heat map with the 3 billion attributed to the United States as a proof that NSA was conducting domestic surveillance, although the heat map itself cannot provide sufficient evidence for that. The 3 billion could very well relate to foreign communications which are just transiting the US or to the American end of for example phone calls where the other end is a foreign suspect. Somewhat more information could have been provided by the bar charts for the US, but these haven't been published. This tiny share for telephone metadata is rather strange given the fact that NSA is collecting all American phone records, but does not so with internet metadata. This seems to indicate that these domestic phone records are not counted by BOUNDLESSINFORMANT and that the internet records are from communications with at least one end foreign. This leaves the remaining 28% of the data to be collected by NSA's other main divisions: Global Access Operations (GAO), which operates mobile collection platforms like satellites, planes, drones and ships, and Tailored Access Operations (TAO), which collects data by hacking into foreign computer networks. The remaining 28% could also encompass data collected by the joint NSA/CIA Special Collection Service (SCS) units and by 3rd Party partner agencies. This listing shows that roughly one third of the data from telecommunication cables are collected by just on single program: DANCINGOASIS. Another third part is intercepted by the programs ranking second, third and fourth, but despite their weight, we still don't know more about them than just their names. Finally, the last third part of this type of collection is divided into numerous smaller and very small programs, a number of which have been disclosed through the Snowden-documents. On June 18, 2014 the Danish newspaper Information and Greenwald's website The Intercept broke a story saying that SPINNERET, MOONLIGHTPATH and AZUREPHOENIX are all part of the RAMPART-A program, which encompasses access to fiber-optic cables abroad, in cooperation with 3rd Party partner agencies from at least five different countries. According to a FAQ document, the BOUNDLESSINFORMANT tool doesn't count data which are collected under FISA authority, so numbers about the famous PRISM program are excluded. However, another source (pdf) says that under PRISM, more than 227 million "internet communications" are collected annually, which is ca. 19 million a month, but it is not known whether these "internet communications" are the same kind of records as presented by BOUNDLESSINFORMANT. MUSCULAR contributes 60 gigabyte of data to the PINWALE database for internet content every day, which is 1,8 terabyte a month. As BOUNDLESSINFORMANT counts 181 million records for MUSCULAR, this would mean that 1 million internet metadata records represent almost 10 gigabyte of (content) data. This correlation can be used to make a very rough estimate of the total amount of internet data collected by NSA. The worldwide total of 97 billion internet records a month would then equal some 961 terabyte of data each month or 11,5 petabyte a year (some numbers to compare are here; the new NSA data center in Bluffdale, Utah can store an estimated 12 exabytes, which is 12.000 petabytes). The SIGAD codes starting with DS denote some kind of joint collection program, those starting with UKC stand for civilian operated facilities of the British signals intelligence agency GCHQ. The total number of data received from these nine countries is slightly more than 1 billion a month, which is just a tiny 0,0045% of NSA's overall collection as counted by the BOUNDLESSINFORMANT tool. Initially, Glenn Greenwald reported in various European newspapers that these numbers represented the phone calls of European citizens intercepted by NSA. But gradually it came out that his interpretation was wrong. The charts actually show numbers of metadata that were collected from foreign communications by European military intelligence agencies in support of military operations abroad. These data were subsequently shared with partner agencies, most likely through the SIGDASYS system of the SIGINT Seniors Europe (SSEUR) group, which is led by NSA. How about some data on the attacks thwarted, or are you going to tell me that Snowman didn't come across any documents about outcome of the programs. Maybe these people could be confined in an island where no intelligence agency could touch them or be related to them in any way. We would see if terrorists would be as nice with them. There are no numbers of attacks prevented worldwide. NSA officials only have said that the PRISM program and domestic cable tapping foiled some 40 terrorist plots. It seems that Snowden had no access to the actual finished intelligence reports by NSA analysts. Therefore we know almost nothing about the results of all these interception programs. I am not a US citizen but I wonder how many lives will be lost due to Snowden’s actions. His revealing of some of the NSA’s capabilities will allow these seeking to do evil the chance of not being detected. Be that drug traffickers to Al Qaeda etc. I really don’t care that the NSA might listen in on a phone call or read one of my emails. The poor guy tasked with that would die of boredom. In a nut shell I am not a target but there are bad guys out there. Sorry but I think Snowden is a traitor and not just to the US. This may come to shock some readers, but perhaps it is due to our horrific foreign policy in which has provoked hatred around the Middle East. After all, I don't think they really hate us just because we have (some) freedom, I think some of these radicals would have not resorted to terrorism if we had tried to make peaceful international trade deals/ relationships - rather than blowing the sh*t out of their countries. When you push people, many times people will push back. Here's an interesting debate over SIGINT gathering/collection. I want, particularly for those aged 60 and above and who care not a jot if they are a target, to be auto-cited - for speeding. Each time google maps running on their phone and using the GSM satellites detects THEY (and only they) are 1m over the speed limit build into the mapping database, it reports the fact to the local police for a automatic fine. Lets ensure folks "feel" the nature of a stasi-state - starting with those who care not if it exists. Criminals and criminals, including those driving at 1m over the limit. "I really don’t care that the NSA might listen in on a phone call or read one of my emails." I do care. They're my phone calls and my eMails, and I want to keep them private. Not because there's anything criminal in them. Just because I can make that choice, and that's what I choose. Anything else effectively makes me the property of the state. This is the price of the society you're happy to surrender your liberties to protect; that those of us who choose NOT to surrender to the state, don't have to. You might not like it, but that's what you're protecting. If you think it's worth protecting, then I get privacy because that's the whole point. If you don't think it's worth protecting, then I get privacy because you don't need to read my eMails. There is no argument in which the society is worth protecting AND gets to read my eMail; it's only worth protecting if it DOESN'T get to read my eMail. Consider this: You can have a conversation with your neighbor in the middle of the street that is protected by the Fourth Amendment and private. If you pick up the phone and call the same neighbor, or chat online, or skype, or email them its recorded in some form. The only difference is a piece of technology exists between the two of you that can be exploited. How can the first conversation be private and protected but not the second? That comparison is not fully correct: every conversation is protected by the fourth amendment, except for when there's a legal reason for law enforcement or intelligence agencies to eavesdrop on it. If such agencies consider it necessary, they can also place microphones directed at people in their homes or even when they are meeting somewhere outside. However, this is somewhat cumbersome, it's true that eavesdropping on electronic communications is easier. It should be noted that there's no evidence for indiscriminate or bulk recording of the content of American communications, at least not by NSA. NSA is only collecting the metadata of phone calls, to use that for targeted contact chaining. I've interned for one of the companies that produces the devices used by NSA and law enforcement for cellular snooping. They do not follow the rules. During product training we were told to "have fun" with the software and actively listen to phone calls within a few miles. These agencies are run by military meat-heads who are under the impression they have permission to do whatever they want and just "classify" anything that's illegal.